Let mutual love continue. Do not neglect to show hospitality to strangers for by doing that some have entertained angels without knowing it. Update: On June 20, 2018 the Presidential Administration passed an executive order reversing its policy of separating children from their parents at the border and allowing families to instead be detained together. This is progress and a small victory, but there is still work to be done. World Vision Urges U.S. Government to Protect Children and Families in Immigration Detention. 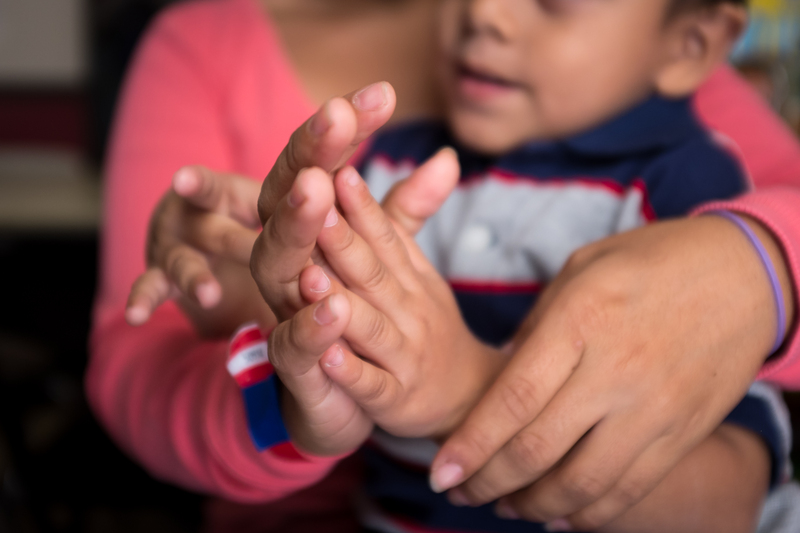 As a child-focused Christian organization, World Vision believes that God intended that children be cared for and protected in a family environment, and urges the U.S. Government to find family-centered and child-focused solutions to immigration detention. While the U.S. needs to address real concerns about our immigration system, children and families should not suffer in the process. The single most important relationship for all children, especially those at risk of violence or in high-stress situations, is that of a parent. Separating children from their parents can have a devastating long-term effect on children’s mental, physical, and emotional development. We call for a compassionate response for all the children and families involved. I love our country and believe we have done so much good. Let’s not let our hearts become hardened because of fear to areas where we need to do better. Children should be with their parents!! AND we must treat all people with dignity. Finally there is a slight breach in the Trump cult of conservative Christianity. I have been a years-long sponsor through World Vision and you have given me hope. Please do not disappoint me. Thank you for speaking up. The first thing I wondered when I heard this on the news was “What is World Vision doing?” I have been a monthly donor for over 30 years. I’m trusting World Vision will be a strong and steady voice on such an important human rights issue. Thank you for your position. The current situation is heart-breaking. This is quite a few verses. However, there are many more. It seems that God is obsessed about how the poor, the widow, the fatherless and the stranger are treated. Thank you World Vision for taking a stand. As a Christian, the behavior of the government is appalling. Any government who willfully separates children from their families can only be described as reprehensible!!! THIS CANNOT BE THE USA I KNOW!!!!!! I am so glad World Vision is addressing this issue. To separate children from their parents, as our government is doing, disgraces our government. To justify it with scripture, as Jeff Sessions is doing, disgraces Christianity. I think what many people are failing to understand is that many of these children being detained are not being separated from their parents. They are coming across the border alone or with adults who are not relatives. The media and politicians are using this as a political football in an election year so they are not being forthcoming about everything. Those whose families are here – they should be detained together until court action is taken. I am not sure what can be done for those children who are here alone or without relatives. Some of these unaccompanied children with non-relatives may be orphans or even kidnap victims. There has to be a more compassionate means of caring for ALL of these children. We separate children from their families on a regular basis in the U.S. when parents are incarcerated but generally there is either foster care or another relative to take care of them. This isn’t always the case with the children coming across the border. We have a duty to uphold our laws but we have a responsibility to do so in a way that is not devastating for the children. My wife and I have been doing foster care for unaccompanied minors for quite some time. We signed up for taking those kids that you talk about who truly do come unaccompanied or with distant relatives. I think everyone understands and supports protecting those kids. I promise you that is not what is happening now. What you are hearing is that truth and not this political football. We have 4 foster children in our house at the moment, all who were separated from there parents. After having just one actual unaccompanied minor over a 9 month span, we have had 7 in our home since this policy change, all taken from their parents. This is a similar story to all the other foster parents we know. The number of kids in a daily basis needing placement in “unaccompanied minor” care is 5 to 10 time’s what it has been. The effects that this has on these kids is devastating. My wife sat with a weeping 8 yo girl for more than an hour tonight and this has become a daily occurrence in our home. I beg you and everyone else to advocate for these kids. They are amazing and resilient but the fact is this is heartbreaking, inhumane, and will have devastating effects on their development because no one can replace a child’s parents. I would like to help fosteting kids like this ones. What can we do for request more information about it. I don’t have kids but we can provide a safe and christian home for them while their separation journey pass. I used to be a Wild Vision employee in Honduras for 7th years and Would like to advocate for them now here from.the USA. Please, send me more information. I would not like to post personal information here but you can email me at dominos1133@gmail.com. I would love to help you get connected and see how you can get involved where you are at. Silas, I’m curious what the average length of stay in your home has been? Are the kids generally back with their folks after a couple of days or is it longer than that. I haven’t seen much information regarding how long until they are reunited. Thanks. Thank you for speaking the truth, the media lies so much it makes me crazy! I’m grateful that you’re using this platform to influence change in a very dire situation. My heart cries for theses families, especially the children and activism gives me a glimmer of hope. Surprising to some evangelical Christians,my “liberalism” comes from my Christian faith. I was overwhelmingly touched by the scriptures above, especially Malachi. We are called to do the gut-wrenchingly difficult task of taking in the stranger. One note: asylum seekers are supposed to come in thru the entry sites and they are doing so, only to be arrested/ detained. I’ve done foster child work and we all knew the parent- child bond is the key. When broken, children suffer for a lifetime. God bless you, World Vision supporters! Hi Eleanor, thank you for your advocacy and your comments on this page. Congressman Bishop should be included, but if it is not working email us at advocate@worldvision.org and we will help you out! Thank you for taking a public stance! The “Trump cult of conservative Christianity”? Does this post have any business being on a reasonable discussion about an issue that has sincere believers on both sides of it trying to figure out what would Jesus do? I don’t think so. Comments like this only shut down the conversation that is so desperately needed. I find it negligent and disappointing that the post was not monitored and removed. Nevertheless I support World Vision in this call to action on behalf of the children. Hello, we appreciate your comment. Our policy is to allow all views and perspectives – we do not monitor comments with any intention to remove them. We welcome your comments along with the comments and voices of others, hoping to create a community of distinct individuals united around the goal of speaking out on behalf of vulnerable children. The United States with at least one undocumented parent. detention facilities and separated from their children.